There are lots of hands to pass the baby to. There are lots of hands to help do the dishes. Family and friends near and far. Heat pads that fit perfectly on the lower back. Ibuprofen to help out the heat pad. My dad and uncle's to do list. Apparently there was more stuff broken around the house than I realised. Gut wrenching, nose snorting, tear inducing laughter. Stories from the old country. Freedom and those who defend it. The boys had to come home early from their after school program because of the weather yesterday. The antilock breaks got a good work out yesterday as I was coming back from grocery shopping. It was snowing when I went to bed last night and it is still snowing now. Current temperature is a balmy 15 degrees. For the first time it should be warmer on the ice in the rink than it is outside. It's going to be a fun day. Crumple zones and reinforced passenger areas that will allow passengers to walk away from a car that has flipped a few times and looks like a balled up piece of tin foil. Modern medicine that makes head colds a little more variable bearable. I don't know where "variable" came from. I thought I was thinking "bearable" as I typed. Ethan: [singing] Hush little baby don't say a word, momma's gonna buy you a mocking bird. He knows more verses to that song than I do. Jewel actually stopped crying to listen to him sing. The service and sacrifice of the men and women in the armed forces and their families. The technology that lets me pay my bills at home in bed in my pajamas. A hot meal on a cold cloudy day. 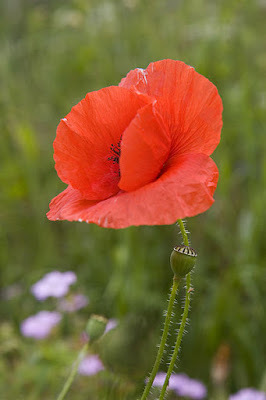 As a kid before I came to the States we always wore plastic versions of the corn poppy on Rememberance Day. The colour always reminds me of the blood sacrifice of the men and women in the armed forces. Thanks to you and your families for your service and sacrifice. The mottos. I had my sister translate these for me. With a self identified black man having won the Presidency of the United States one would think that we would stop hearing about how racist America is. One would be wrong, at least according to Bill Moyers. In an interview with Terry Gross of NPR's Fresh Air Moyers claims that whites in the south who didn't vote for Obama did so because of racist beliefs. I waited in vain for the host of the show to challenge Mr. Moyers on his speculation about the motives of southern white McCain voters. Diane Rhem would never have let him get away with saying something so outrageous. As I sat in the car getting all indignant on the behalf of fellow McCain voters I thought, so this racist stereotype of the south is what post racial means? I also thought, what he couldn't think of ANY reasons other than racism why someone wouldn't vote for Obama? Finally I thought, what would he make of me a black woman who didn't vote for Obama and never entertained any fantasies of doing so? Warm sunshine in November. It's going to make all the snow and ice that much harder to take when it finally does come but for now I'm loving the warmth. American democracy, gotta love it. The defenders of our freedom. I've discovered a new favourite food of Isaiah's, quesadillas. He calls them pizza but as they are cheap and easy to make at home he can call them whatever he wants so long as he keeps eating them. The boys are doing well in school, so say their teachers, therapists, and various support staff. All of the teachers, therapist, and various support staff that have helped the boys along in the past few years. Things are pretty sedate in the house this morning. Sis 1 and I talked this morning of our resignation to gracefully endure the next four years. Interestingly we've both been mistaken for Obama supporters this election season. She in a red part of the state and I in a blue part of the state. I'm not feeling the whole historical first black president thing. The President elect and I are too far apart ideologically for that. Anyway, to President elect Obama I say, good on ya mate and God bless America. I've been meaning to share this bit of text ever since I read it several months ago. The following is an exchange between Sergeant Fred Colon and Corporal Nobby Nobs of the Ankh-Morpork City Watch from Thud! (Wiki with spoilers, Amazon) by Terry Pratchett. "Dunno, sarge. Freeing slaves, maybe?" "Defending yourself from a totalitarian aggressor?" "All right, I'll grant you that, but--"
"Saving civilization against a horde of--"
"It doesn't do any good in the long run is what I'm saying, Nobby, if you'd listen for five seconds together," said Fred Colon sharply. "Yeah, but in the long run what does, sarge?" The whole book is a good read. 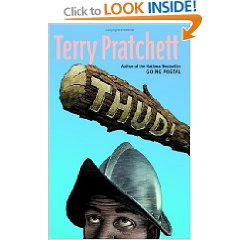 Leave it to Terry Pratchett of make ethnic and fundamentalist strife damningly funny. So the long awaited long dreaded day is finally here. Get out and vote already and put an end to possibly the longest presidential campaign in American history. I'll be heading out as soon as the boys leave for school. I don't want to hear about 2012, unless you're talking about the Olympics, until 2012.